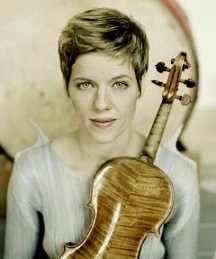 Isabelle Faust is a German violinist and teacher born (in Esslingen, Germany – near Stuttgart) on March 19, 1972. Faust is a supremely gifted artist known for her thorough involvement in both, the early music and contemporary styles of playing, possessed of a markedly identifiable sound who nevertheless maintains an unorthodox view of marketing – she just plays and lets the chips fall where they may. As one writer puts it, she has an admirable and “refreshingly devil-may-care” attitude. I do not usually exercise the privilege of writing subjectively on this blog but there are exceptions. To quote further, Faust delights in “the pure process of producing what I think the composer wants to hear.” She began her violin studies at age five. By age 11, she was playing second violin in a string quartet she helped organize. She kept playing in this quartet until age 15. She had up to then been studying with Christoph Poppen. During the summer she would study with Denes Zsigmondy, a Hungarian pedagogue who helped her navigate the (Bela) Bartok violin sonatas. However, she gives most of the credit for her training to Poppen, with whom she studied between 1988 and 1994 at the Advanced School for Music in Detmold (Germany) (Musikhochschule Detmold.) Detmold is located about 120 miles north of Frankfurt. None other than Johannes Brahms spent time working there. As do also many other modern concert violinists, Faust plays contemporary music – music which I consider sub-standard and (for the most part) intensely dislike - as often as she can. Many contemporary composers have written works for her or dedicated works to her – I won’t bother to list them since I don’t care for their work. Faust’s technique is truly fabulous and not over-stated – her considerable technical prowess is not worn on her sleeve, so to speak. What intrigues me is her sound. It has been written that rather than “merely mastering her instrument and its repertoire, experiencing and deeply exploring music [is what] lies at the heart of her work.” The New York Times wrote that "her sound has passion, grit and electricity but also a disarming warmth and sweetness that can unveil the music’s hidden strains of lyricism." Faust won the Leopold Mozart violin competition (Augsburg, Austria) in 1987 (at age 15) and the Paganini competition (Genoa, Italy) in 1993. I have heard that the winner of the Paganini competition has the right to play a recital on Paganini’s famed Cannone Guarnerius violin but there is no mention of her doing that. The Dvorak concerto was one of the first major concertos she recorded (2003.) Her recording of the Beethoven concerto was released in 2007. Faust has also recorded the violin sonatas of Bartok, Beethoven, Szymanowski, Janacek, and Bach. She performs extensively at chamber music festivals around the world and, of course, has worked with almost all of the major orchestras and conductors. She made her U.S. debut in 1995 with the Utah Symphony. She was 23 years old. Her first appearance with the New York Philharmonic did not take place until March 20, 2013 - she played both Bach concertos on that occasion. Her current violin is the Sleeping Beauty Stradivarius of 1704. As far as I could ascertain, before Faust obtained it, this Stradivarius had never been played by a concert violinist. In fact, it is one of very few Stradivarius violins with its original neck intact. Supposedly, it lay dormant in a bank vault, in its original violin case, for decades, and was named Sleeping Beauty for that very reason. The original label reads 1720 or 1729 but violin "experts" have decided that the year of construction is closer to 1704. Claude Lebet - an obscure luthier - found it in 1991. Faust has also played a JB Guadagnini of 1761. She is shown here playing the Beethoven Triple Concerto with two of her colleagues and the Orchestra of the 18th Century (the Netherlands.) It is a magnificent live performance from 2010. This early music orchestra (founded in 1981) is very rare in that it does not audition its members. Its conductor is Frans Bruggen. If you prefer hearing a much shorter piece, she splendidly plays the Bach g minor concerto in this YouTube audio file. There is another Sleeping Beauty Stradivarius from 1726 but scant information is available on that violin. Claude Lebet - the obscure violin maker from Rome - is (or was) embroiled in a scandal similar to the one which brought down Dietmar Machold.